Guitar and bass pedal boasts classic tube tones. The Peg Leg boasts two modes aimed at providing a wide range of compressed and overdriven sounds. In parallel mode the incoming signal is split, running through both the drive circuit and the compression circuit, and then joined back together at the output. In series mode the signal is routed through the compression circuit first, followed by the drive circuit. Features include controls for Drive Vol, Drive, Comp and Tone; a switch for the Parallel/Series signal placement; LED indicator; and premium audiophile components with silent switching die-cast enclosure. The Peg Leg is powered by 9V battery or a standard negative center 9V Power Supply. 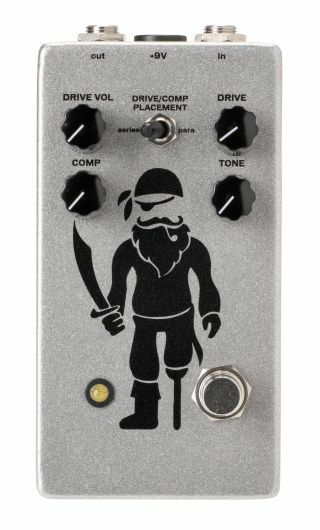 The Pirate Guitar Effects Peg Leg Overdrive and Compressor Pedal is available for $179. For more information or to purchase, head over to PirateGuitarFX.com.